All publications from Het Talenhuis (literal translation; The House of Languages) are published digitally online. A number of publications are also published in English, digitally and online. The English publications are a translation from the published Dutch books. 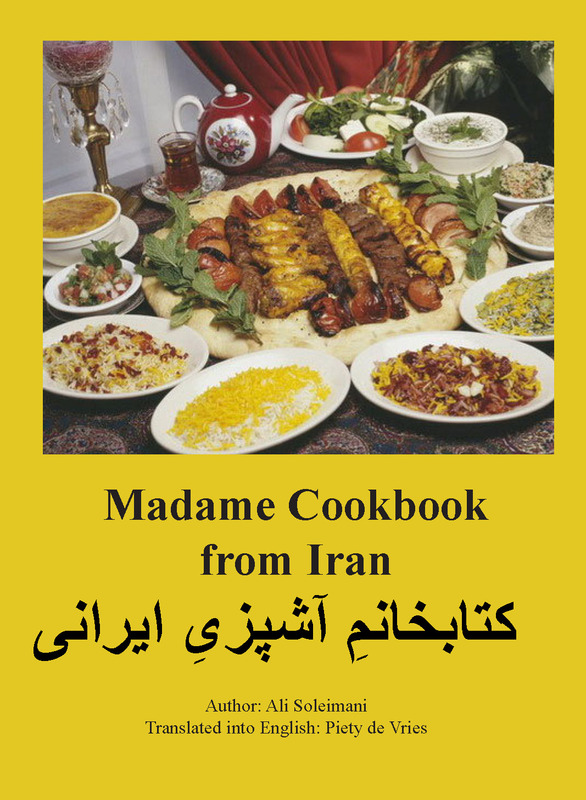 Here you will find the English version of the book Mevrouw Kookboek uit Iran (translation; Madame Cookbook from Iran). A few volunteers from Het Talenhuis have taken care of the English translation, led by Piety de Vries. All those who have contributed to the English translation are thanked, especially Patrick Veenstra. To thank Piety de Vries as well, her foreword is included in this book, mentioning her name as the translator. This interesting cookbook contains many recipes of soups, kababs, meatballs, rice tables, stews and refreshing desserts. For those who do not eat meat, including myself, there are some vegetarian dishes in this cookbook and most meals can be prepared without meat or with a meat substitute, which makes it easier to cook meals for different occasions and for everyone's taste. When the temperature gets higher outside, I sometimes like to browse through the desserts because they are very easy to prepare and also very delicious! This is the first time that I have had the honors to translate a cookbook from the original printed Dutch to English, commissioned by Het Talenhuis (literal translation; The House of Languages). What interests me is that the cookbook contains only Iranian recipes. The reason why this interests me is because I have a lot of interest in other cultures. The names of the dishes are also printed in Farsi which makes the experience even better to cook foreign dishes. During the translation of this book I got a look at what kind of dishes are served in Iran and what their eating habits are. Translating Madame Cookbook from Iran was an educational experience for me. I would like to thank the author of this cookbook, Ali Soleimani, for giving me the opportunity to translate this book, as well as anyone else who contributed with the translation of Madame Cookbook from Iran. You shall begin to eat first, in case if thou are the host. You shall finish eating last, in case if thou are the host. You shall not eat before elderly or scholars if they are in your presence, unless thou are the host. You shall not sit quietly at the table, it is advisable to talk about fun and pleasant topics. You shall treat your table guests kind and honest, even give him or her precedence. You shall treat a guest three times. You shall take an open and cheerful initiative and cozily participate at the table. You shall not glare at other people, when they are eating. You shall not bring up unpleasant or rude things that might bother others. The dining table should be in a sufficient amount of light, because light has a direct effect on appetite. Candles and candlesticks are here a romantic option. You shall eat at a set time. The time of breakfast is the most important, as early as possible. The time for lunch is around noon and dinner four hours before bedtime. You shall not eat, especially your breakfast, on a workbench or in front of the television, understood! You shall know that nothing can decorate a dining table and generate appetite better than a salad. A good salad contains tomatoes, cucumber, lettuce, onions etc. A yogurt and cucumber-mix can replace the salad. The best one is a marriage between Mrs. salad and Mr. yogurt! You shall know that some people are accustomed to also eat fruit with their meals. However, this is discouraged by others, but not strongly. You shall know that drinking water when eating depends on the habit of the person in question. However, it is not advisable to drink cold water with a hot meal. You shall know that in general the consumption of salad, vegetables, fresh herbs and dairy products are not only recommended, but are almost mandatory. You shall know that obviously not all of the recipes from Iran are included in this cooking book. A cooking book with all the recipes from Iran would of have a magnitude of Amsterdam to Paris! Each population group of Iran and each district has its ‘own’ recipe. There already are 12.000 registered recipes of only soup in Iran. You shall know that in this cooking book is attempted to include the most famous recipes from Iran. Nowadays all recipes from the world can be found on the internet. The “Madame Cookbook from Iran” is just a souvenir, and not a recipe encyclopedia. just one of them. These recipes are also prepared in other places in the world, and therefore they all aren’t real Iranian. You shall soon see that the vegetarian recipes are listed with ‘vegetarian’ and this icon on top of the recipe. You shall by replacing meat- and chicken broth with water and replacing the meat products by nothing of the most dishes in “Madame Cookbook from Iran” make a vegetarian dish! You shall besides a ‘General table of contents’ [index] (p. 5) also find ‘English alphabetical index of keywords’ (p. 241), a ‘Phonetic alphabetical index of keywords’ (p. 246) and a ‘Persian alphabetical index of keywords’ (p.251) in this cooking book. You and yours will already be wished a lot of cooking- and eating pleasure. Notes and comments are very welcome! You are thanked for your attention and everyone who has contributed so that “Madame Cookbook from Iran” could be achieved. Not to mention, those digital contributors, particularly on the internet, are also thanked for their work! N.B. Bij bestellingen uit België of andere Europese landen wordt 10 euro extra portokosten in rekening gebracht! N.B. In case of orders from Belgium or other European countries, 10 euro extra postage will be charged! Deze prijzen zijn geldig tot / These prices are valid until 01-01-2020. INCLUSIEF B.T.W. EN VERZENDKOSTEN PER EXEMPLAAR. Bij ontvangst van uw bestelling, ontvangt u ter voldoening een factuur. Stuur geen geld of cheque mee. UW BESTELLING WORDT ZO SNEL MOGELIJK VERWERKT. N.B! Geachte heer / mevrouw! Het kan door omstandigheden voorkomen dat dit formulier ons niet bereikt. Daarom verzoeken wij u vriendelijk om uw bericht nogmaals via een E-mail naar ons: info@talenhuis.com op te sturen, indien u binnen drie dagen geen reactie van ons hebt ontvangen na het inzenden van uw formulier. DANK U VOOR UW BELANGSTELLING!